The ERAS letter of recommendation should be constructed in favor of the applicant. The writer needs to make sure to include the best assets of the person so that it can strengthen his application. The letter of recommendation for residency should also be constructed in compliant to the ERAS LoR. ERAS LoR length: The LoR length is one page, but some schools or programs accept two pages LoR, especially if the program requires some things to be included in the letter. In order for your letter of recommendations ERAS available to programs, you need to confirm the upload of your LoR and assign the letters to programs in MyERAS. The recommendation letters should be submitted online to the system required by the program. How many LoRs ERAS to submit: There is no limit on how many letters of recommendations you will submit to the ERAS, but make sure to check the website of the program, whether they require you to submit three or four letters of recommendation coming from chair, dean and faculty members. Be sure to know when the ERAS letter of recommendation deadline is so that you can submit it on time as well. Limit the letter to one or two pages. 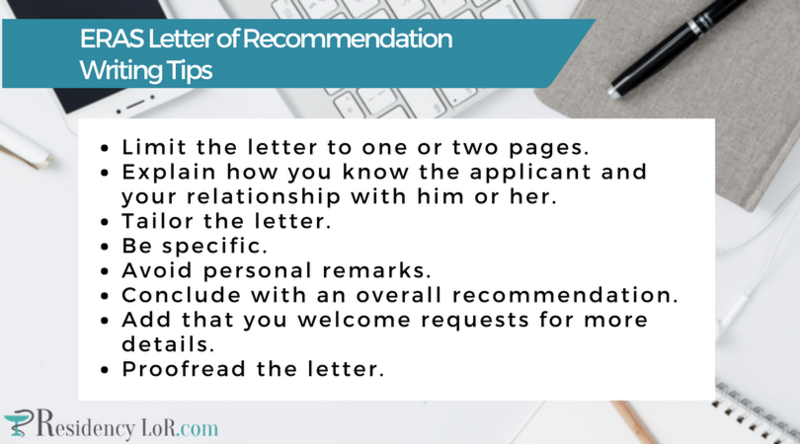 Explain how you know the applicant and your relationship with him or her: If you are asked to write a recommendation letter for residency application, it is essential to state how long you have known the applicant. In this manner, the committee will have an idea that you know the applicant well. Tailor the letter: Give the reader a sense of the candidate’s potential as a future physician. Some of the certain areas to comment include analytical skills, intellectual ability, communication skills, attitude toward learning, personal achievements, persistence and initiative motivation. Be specific: Provide specific examples of your observation as well as stories about your experience with the applicant reflecting her/his professionalism, leadership, clinical acumen, interpersonal and potential skills as well as passion for medicine. Avoid personal remarks: In writing, avoid mentioning race, age, marital status, ethnicity, and number of children, personal and physical characteristics. If some instances, you believe that it is essential to the applicant’s potential and performance, get permission to the applicant if she or he wants those details to be included in the letter. Conclude with an overall recommendation: Make sure to indicate how well qualified the student for the residency as how he can become a great future physician. You can make a comment whether you would choose the applicant for the residency program or not, if you were to choose. Proofread the letter: You need to pay attention to the spelling of the candidate’s name. If you are using a template, be sure to change the name in the letter. Address the letter to “Dear program director”. Include student’s AAMC ID number in the letter. Make sure to spell the name of the candidate correctly. Sign the letter, either by signing scanning or printed copy. Put the letter on official letterhead. Save the letter as PDF file. Letter writers must upload the recommendation letters in PDF format via ERAS portal link. The candidate should give the letter request form, which includes a unique identifying number for the letter and instructions for uploading. Letter requirements: In accordance with the university policy and federal laws, authors of recommendation letters should refrain from comments about color, gender, race, age, religion, marital status, sexual orientation, citizenship, national origin, political affiliations or medical condition of the applicant. The letter of recommendation for fellowship should include the complete name of the applicant preferably in the first paragraph. LoR should not reference a particular program or institution. Letter of recommendation should be word-processed or typewritten. It is better to check what the program requires when it comes to LoR formatting. LoR should be printed on a professional letterhead. Recommendation letter requires the signature of the writer. The writer should use black or blue ink for clear scanning. Recommendation letter should not include MCAT scores. Recommendation letter should conclude with identifying personal details: full name, mailing address, and title institution, email address and telephone number. For given email, a confirmation will be sent informing that the program received the letter. If you want to get into the residency, you can ask for professional help. Good writers know about the most important details to include confirming an applicant’s skills and fitness for the program. Their ERAS letter of recommendation writing service can help in increasing the applicant’s chances of being selected. Checking for an ERAS letter of recommendation sample will help you understand what to know in writing. You can also ask them for a sample ERAS letter of recommendation to get an idea of how they write an impressive LoR. Overall, you can ask for a sample LoR for residency from the pros and then ask them to write the letter for you if you think you cannot write it impressively yourself. 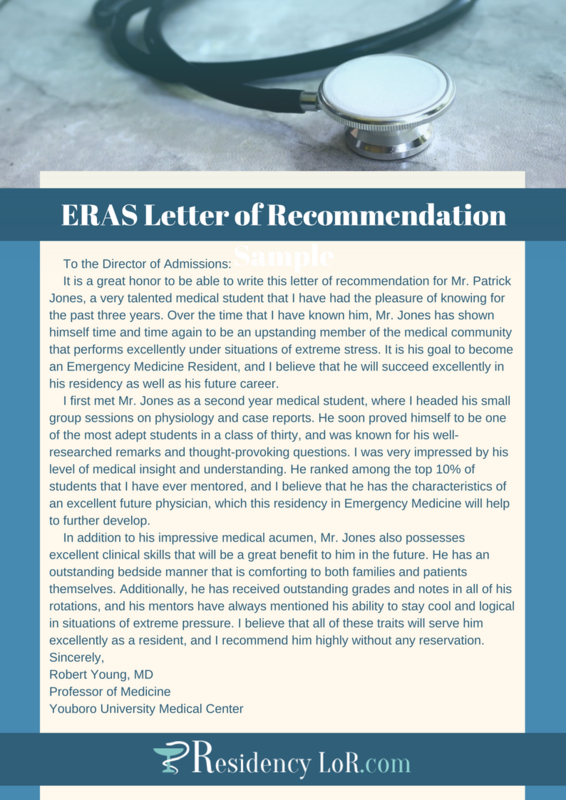 Learn more about writing an impressive ERAS letter of recommendation today!